The Lucid Dream's third album Compulsion Songs has them out in territory all of their own, pushing back boundaries of their own sound and exploring new avenues. It's a natural darker progression from their self-titled second album and will delight those that have followed them from the start and draw in and snare the curious. 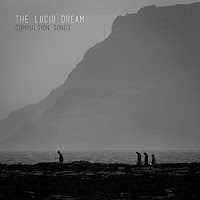 That Compulsion Songs clocks in at forty-five minutes for seven songs and that two of those songs, The Emptiest Place and 21st Century take up less than five minutes between them is revelatory about where The Lucid Dream are taking us with this record. There are no rules, no boundaries, no scene-fitting compromises being made here. Bad Texan, released as a limited edition single earlier this year, opens up proceedings with its powerful drum beat and effects laden guitars that announce the album as one to be reckoned with, whilst the magnificent Stormy Waters sounds like something The Stone Roses should have come back with, a trippy repetitive beat that sticks inside your head and a vocal that could be singing about anything, but sounds absolutely perfectly atuned to the rhythms of the song. The eight and a half minutes of I'm A Star In My Own Right are a mind-bending journey through space-shifting dub territory with vocals that sound like they're coming at you from the near distance. Its real brilliance in its simplicity, the way the bass takes control yet doesn't try and overpower the listener with technology or volume but still mesmerises with its claustrophobic warmth. The two shortest songs on the album take us off in another direction which is one of the real beauties of Compassion Songs, that the listener can never sit back and rest on their laurels. The racing beat that underpins of The Emptiest Place makes it feel like the perfect soundtrack for a spaced-out western movie whilst 21st Century sounds like a wild segment from a plug in and play jam, but one that makes perfect sense in the context of the record. Nadir is much more sparse in its approach than what's gone before with a dark brooding menacing undercurrent and it segues almost unnoticed into Epitaph making an eighteen minute monolithic multi-headed beast. The truth of the matter is that there's so much going on here across the two songs, so many ideas being thrown into the mix that where one song ends and another begins is almost an irrelevance. For a band that's been lumped in so often under the psychedelic scene, this is a world apart from that, the vision much wider, the scale so much more all-encompassing and the impact so far removed. This is expansive, inventive and ambitious in its scale, far more so than it's likely to reach because of the state of the modern music industry. Compulsion Songs almost defies description, is it a dance album or is it a rock album, its chameleon-like state however means it's a record that never stands still, always shifting, always ambitiously outward looking, always searching, revealing a journey through the band's creative mindset as it progresses.